The Tomb of Hafiz Rahmat Khan, Bareilly (U.P.). 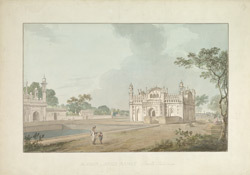 22 May 1789.
bl.uk > Online Gallery Home	> Online exhibitions	> Asia, Pacific and Africa Collections	> The Tomb of Hafiz Rahmat Khan, Bareilly (U.P.). 22 May 1789. Bareilly, situated on the Ramganga River in Uttar Pradesh, was founded in 1537 by the Bas Deo and Barel Deo brothers. It later became the capital of the Rohillas, a migrant clan that gained control of the surrounding territory. In 1772 Rohilkhand was invaded by the Marathas, however the Nawabs of Avadh came to the aid of the Rohillas in repulsing the invasion. After the war Nawab Shuja-u'd-Daula demanded payment for their help from the Rohilla chief, Hafiz Rahmat Khan. When the demand was refused the Nawab joined with the British under Warren Hastings to invade Rohilkhand and Hafiz Rahmat Khan was killed in the ensuing battle at Mirranpur Katra in 1774. The whole of Rohilkhand (including Bareillly) was surrendered to the East India Company by the treaty of November 10th 1801. Later, Bareilly was a centre of disaffection for the entire area in the Indian Mutiny of 1857.